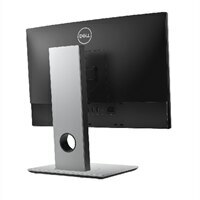 Dell OptiPlex 5260 All-in-One Height Adjustable StandThe Dell™ OptiPlex 5260 All-in-One Height Adjustable Stand maximizes productivity and comfort in the workplace for users of the OptiPlex 5260 All-in-One systems. With the ability to tilt and raise your monitor to the optimal viewing level, you can ensure that your workspace is as comfortable as possible. Swivel the monitor in a 45-degree angle to quickly show coworkers your screen or to make a presentation to a small group. With bi-directional pivoting, you can rotate your monitor screen between portrait and landscape mode by simply grabbing your screen and rotating to the right or left. Maximize your productivity and work in the most comfortable settings to meet your personal needs with the Dell OptiPlex 5260 All-in-One Height Adjustable Stand. Built for the OptiPlex 5260 All-in-One system, this adjustable stand allows you to tilt and swivel your monitor however you wish. With the freedom to move your monitor in just about any direction, you can feel more at ease in your workspace. If you’ve ever experienced neck pain from straining to look at your monitor, you will appreciate the easy maneuverability of the OptiPlex 5260 AIO Height Adjustable Stand. No longer will you need to set your monitor on a pile of books to comfortably view your screen. Simply lift your monitor and it will rise up to the perfect viewing level for you. Tilt your monitor up or down at various angles for even easier viewing. The OptiPlex 5260 AIO Height Adjustable Stand also rotates with bi-directional pivoting so you can easily work in portrait or landscape mode. Simply grab your monitor and rotate it to the left or right. 45-degree swivel allows for a more flexible work station With the Height Adjustable Stand, you can also swivel your screen to the left or right at up to a 45-degree angle. This is perfect for professionals who use multiple monitors in their workstation. Swivel to the right or left with ease to quickly show your neighbor what you’re working on or to present a document to a group of coworkers on the fly. The Dell™ OptiPlex 5260 All-in-One Height Adjustable Stand maximizes productivity and comfort in the workplace for users of the OptiPlex 5260 All-in-One systems. With the ability to tilt and raise your monitor to the optimal viewing level, you can ensure that your workspace is as comfortable as possible. Swivel the monitor in a 45-degree angle to quickly show coworkers your screen or to make a presentation to a small group. With bi-directional pivoting, you can rotate your monitor screen between portrait and landscape mode by simply grabbing your screen and rotating to the right or left.